I am glad that last spring I left many plants go to seeds. Now we have many self-seeding plants that the garden take care of itself while continuously provide us food. 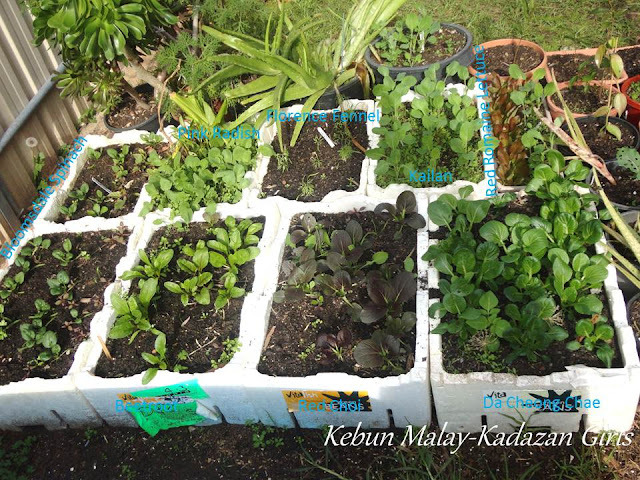 Not only edibles, but provide us many volunteer flower seedlings around the garden. The weather has started to get colder, maximum temperature has been below 15 degree Celsius and minimum average 4 degree Celsius this week. 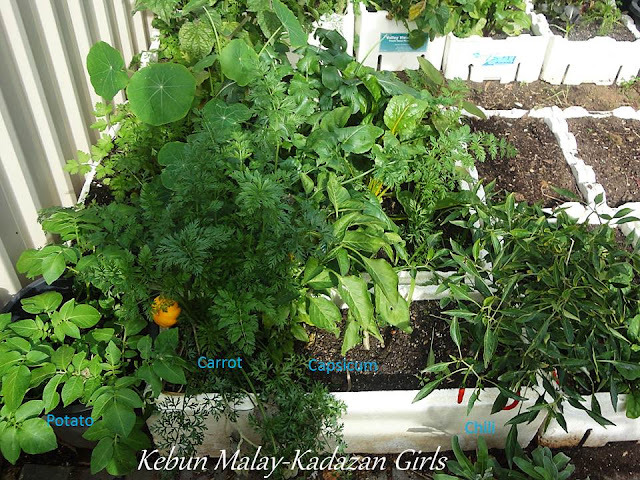 The container garden needs weeding but its hard to judge still which one is veggies, flowers or simply weeds. With the mood and mental state I am currently in, I just let it be for awhile since the brain is not functionally as sharp as when I am in good shape. I might make wrong decision. I have just started a low dose of antidepressant medication this morning and feel the moods lifted up a bit with a bit boost of energy but the minds feel like in clouds. 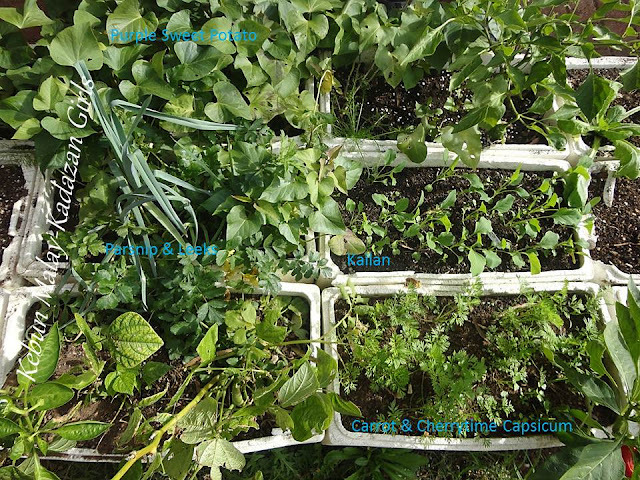 In this section, rainbow chard, tomato and leaf amaranth (bayam) that can be seen here are actually self-seeded plants growing among vegetables which were sowed March-April this year. There are some warm-loving vegetables in this container section that I am going to leave it alone and treated as perennials like capsicum inter-planting with cold season plants. We still actually have several sweet potato plants growing in containers that have not been harvested. The last parsnip and leek plants we have in container, saving them from harvest until I can really enjoy them. We grow sweet potatoes at this section previously, after cleaning it up last month we sowed some Asian greens, spinach, beetroot, radish and florence fennel in this corner. Hopefully by July~August this corner will started to provide us fresh harvest. Lots of weeds there. The cucumber season is over as seen in the photos and need to be disposed. So that other plants will receive more light from the sun. Behind the trellis, there are some containers as well with plants that now needed some light. It works well in summer to give some shade with the cucumber foliage but not now in winter. Growing cape gooseberry plants for the first time in containers. I have not harvest any fruits from this plant yet though its fruiting at the moment. Not sure how tolerant is this plant with our winter here. The cape gooseberry plants did not like our dry summer here as it hardly grows at all during that time. The plant pick up growth again early fall. The cape gooseberry is sharing the container with capsicum and carrots. The capsicum plant was taller than the cape gooseberry previously in summer and has already produce fruits. Only a few capsicum fruit left on the plant as it really does take a long time ripen in this cold weather. 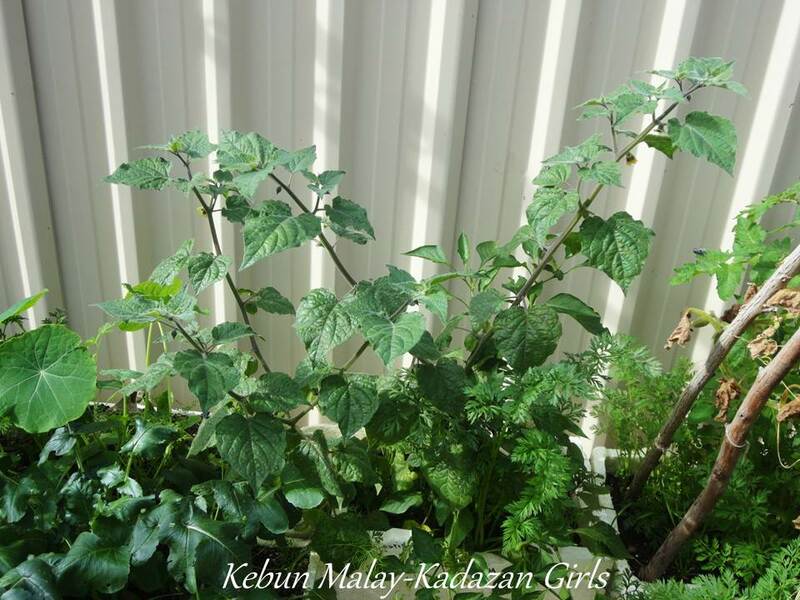 Now that the cape gooseberry plants has certainly grown tall and bushier, it will helped protect the capsicum plants against cold wind. This veggie corner needs to be organize a bit. So many different plants self-seeded at the back row containers like nasturtium, flat leaves parsley, chinese spinach, pot marigold, garlic. I can't see our florence fennel seedlings anymore must be suffocated by the nasturtium. Waiting for 'Jack be little' pumpkin ripening (can you see an orange fruit peeking near carrot leaves). Chilli and capsicum ripening as well and I am collecting seeds from this plant. This chilli plant is the second generation grown from seeds we collected and it has been tolerant with our summer heat and winter cold here now. It is a very hot chilli type, I was collecting the seeds without gloves this week and my hand stings for 2 days. Diana, the gardening will do you good. I'm glad to hear that you are feeling a bit more positive. When you move back to Malaysia, will you leave the container garden for the next occupants, or will you dispose of it beforehand? Diana, your garden was so inspiring. Memang ada plan nak balik Malaysia ke? These are very impressive gardens. Everything looks wonderful. You're so lucky to have so many volunteers - You must be doing something right if they want to come back so badly! Lovely chilies there. My Mama is so jealous. Her garden failed! Simply because my furblings keep digging the roots, peeing and pooing in the containers too. purrr...meow! The containers look lovely, like decorative plant boxes. Especially the amaranth that puts in a contrasting colour with the glossy green veggies. Love the way the Nasturtium leaves poke out from the carrot. Glad to hear that you are feeling better. I think it is thr ight decidion to wait until you can recognise the plants. very economical to have plants self seeding! hi diana, glad to know that you are moving on a positive note. keep on with your gardening, things you are passionate about. the plants are growing very well, cute orange pumpkin there! so orange, it must have a very high carotenoid content. noticed you know how to combine your plants,that they compliment each other well. I'm always amazed by how productive your containers are. I grow lots of things in pots too but they don't ever seem as productive as yours. I'm seconding what Liz says, they do look lush! I really should make good use of the space I have as you did with your garden. I am wondering did you purchase the styrofoam containers or did you repurpose them? Great to hear you are on the mend. :-) I also felt a lot better when I cut out certain foods from my diet (wheat, sugar, peanuts) and increased butter and cheese, as well as coconut oil. Perhaps this might be worth exploring in your case. I have started to harvest my cucumber. One by one. So we have to share each of them each time. You've got a lot still going on in the garden. It looks very productive! So many different plants growing all at once! Self seeded plants are my favorite and such a nice gift from Mother Nature. I see the little pumpkin peeking through, but can't see any plant. For me this one would take over the whole area. I really like how all the containers connect together. You had a lot of self seeders! Your garden looks lovely. You have so many greens and other plants growing beautifully. Good to hear you are doing better. I hope you can feel positive without the pills soon. edible garden yang sangat menarik dan subur dengan sayuran, sangat memberi inspirasi! :)thanks. keep up the good work and may you feel your usual self again soon ya. Your garden really inspires me! Lovely veggies! You have an amazing container garden. Even more inspiring is all the self seeding that is happening in them too. Glad you are feeling a little better. I hope you continue to receive good help. that's wonderful to have all those self-sown containers! Hope you're feeling good today! my container still empty..can't wait for the seeds to grow and eating healthy, your garden really inspires me! selfseeded vegetables are always welcomed! there's really so much happening in your garden! would like to see the cape gooseberry fruit when they're ready to be picked! Mark~If the container is still fill with plants I will give it away but the empty ones probably be disposed. Hernyhafiz~Insya-Allah balik kut hujung tahun ni. Cher~I have been away for more than one weeks now wonder how the plants and pests doing together at the moment. JGH~The volunteers usually helps giving the sign or indication of the right time to sow certain veggies. Cat-from-Sydney~Feline giving too much fertilisers on your mama plants. Wonder if covering the soil with black plastic sheets around the plant will help. Sean L~The amaranth are becoming weeds in the container garden but it does give a lovely contrasting colour with the greens. I should not complain it gives free food with no effort. Sue~Yes very economical with plants self-seeding and save time too. cookingvarieties~The pumpkin must have very high carotenoid content like orange carrot. Thanks, you take care too. Hugs. Liz~I usually direct-sowed seeds in containers now to reduce time for transplanting. I am also lazy with thinnings. Might be that reason the containers look full with plants. Mama Pongkey~ The styrofoam are collected from the weekend market garbage bin, free!Thanks for the nutrition tips for healthy mind. Rainfield61~Home-grown is always the best and sharing is also the best way to enjoy and appreciate them. Tina~I feel very blessed with the edibles the garden has provided us now. Kate~Yes self-seeded plant are definitely a favourite gift from mother nature. Daphne~The pumpkin plants are dying due to the cold weather so all the leaves has wilted. Gardener on Sherlock Street~Its fun to arrange the containers around. So I won't get bored with the same layout. 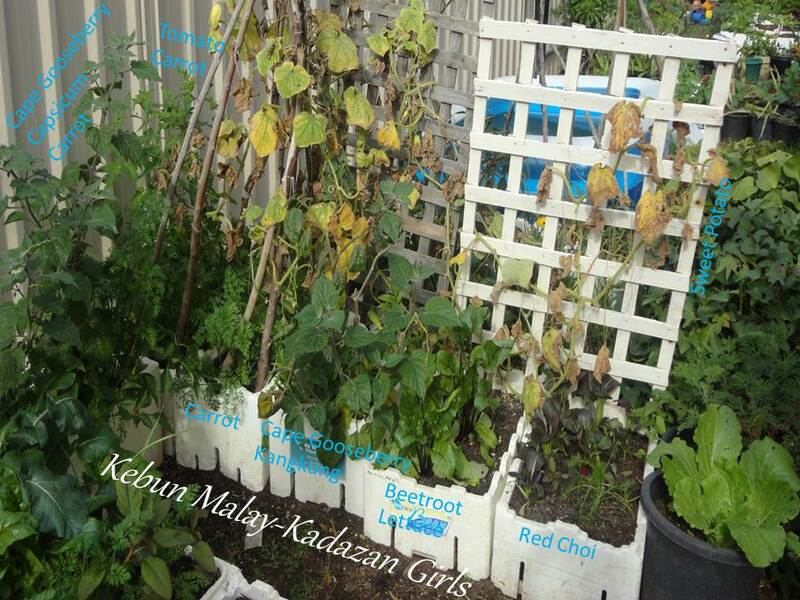 baguznet~Good Luck with your gardening project! I have to start a new garden again next year when we move. Sri Ranjani~Yeah I hope that I won't need the pills anymore. But I am just having a very small dose 10% than what other people prescription usually does. Wani SC~Terima kasih. Harap I be more motivated soon. Kitchen flavours~Any new projects in your garden? I like your garlic project previously. KitsapFG~Sometime its hard to keep up harvesting over-wintered vegetables in spring which ended up with them flowering. But it is rewarding too sometime as they provide self-seeded plants and the flowers attract benificial insects. 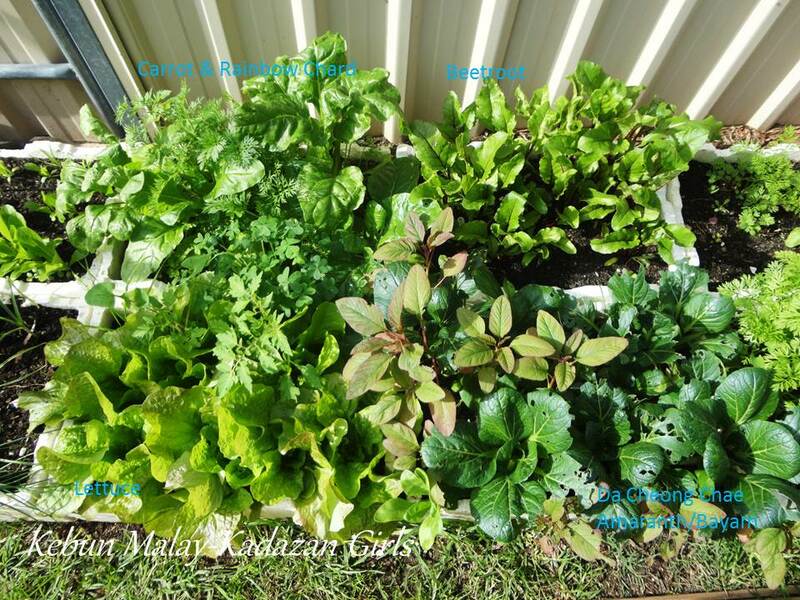 Wendy~The container garden has help us with all year round supply of harvest. Lynn~Hope the seeds you sow will provide you with many fresh edibles soon. Malar~Self-seeded vegetables always welcoming in the garden :). Lrong~Have been accumulating seed packets each year which we try to find space to grow them bits here and there. Lena~ The cape gooseberry does take sometime ripening in our cold weather now. I wonder how the fruits are now since we been away.